Another Week…Another Week in Review hostessed by the lovely Meg at Clean Eats, Fast Feets. I was all organized last week and had things planned out for my review. This week I’m flying by the seat of my pants trying to remember what the Heck I did with SEVEN DAYS! Guess we’ll Both find out!! 1. My Gym time was cut short this week. I worked out 3 times as opposed to 5 last week. As much as I enjoy the gym and I know the benefits I get from it, some days life gets in the way and I just don’t get there. Next week will be tricky too because we’re going to be away, but I’m going to try to do my best to get activity in even though I’m not at the gym. I’m in control of my activity level and I need to make the most of it. A friend of mine started a FitBit challenge last week and it’s great to be competing against others. It makes you keep going. I’m going to suggest we do it again this week! 2. 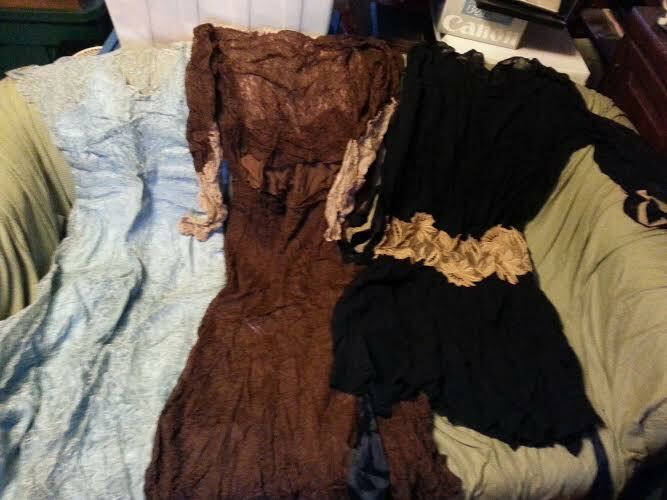 For many years I’ve been collecting antique dresses. I haven’t done much with them over the last 10 or 15 years. They sat in storage boxes. About a year ago I had contacted someone who buys and sells antique clothing. I wasn’t ready to get rid of them at the time but this week, I decided it was time. I took photos of all of them (believe me, this is just a few!) and sent the info to the lady interested in buying them. Hopefully in the next few weeks I’ll have them all packed up and shipped off to her. As I said on Instagram, it’s like parting with an important piece of my youth. But I’m doing this to raise money for our move to New Mexico. To me it’s worth it. I’m trying to sell anything I can. Next is my pottery collection! 3. I’ve been doing a lot of reading. Started and finished Pretty Girls by Karin Slaughter. Really enjoyed this. It was one of those books that starts slowly but once you’re into it you can’t put it down. I like that. I’ve enjoyed all of her books. Only problem is that since the beginning of the year I’ve read ALL of her books. This is her newest one and now I’m finished. She better get writing so that I have something to read! 4. I thought I was doing a good job on Weight Watchers this week but I had a gain anyway. At this point in my life I don’t really worry (well not TOO much) if I have a gain. I’m 14 pounds under my Weight Watchers goal and I pretty much stay there regardless of what I do. I’m pretty good at writing down all of my foods and staying on track. It’s just frustrating and I guess it always will be when I have a gain and I can’t pinpoint the reason. That’s my week. Not very interesting but that’s the way it is sometimes. I’ll try to make next week more Exciting. Don’t forget to check out all of the other listers over at Clean Eats, Fast Feets. It’s always a lot of fun! This entry was posted in Uncategorized and tagged sorting and packing, Week In Review, Weight Watchers. Bookmark the permalink. I went through a period where I obsessed about every ounce I gained or lost…weighed myself twice a day…then I read an article that said if you eat properly and exercise every day your body will find it’s ideal weigh and stay there…well, my body’s ideal weigh is about 5 to 10 pounds more than my ideal weight but I am learning to live with it…now, if I only hadn’t bought that bag of orange slices! I’m so glad you remember all of that. Hugs! Congrats on being ready to sell those dresses Fran. That’s really a big deal. I know it is, and I’m super proud of you for prioritizing New Mexico over it. It can be hard to let go of memories. Just think of it this way, selling those dresses gives you room and the freedom to make new memories. Happy Monday, and thanks for linking up. Sell the house, not the pottery collection!! !